The ideal conditions for coffee trees to thrive are found around the world in along the Equatorial zone called “The Bean Belt,” located between latitudes 25 degrees North and 30 degrees South. Finicky Arabica grows best at high altitudes in rich soil, while the heartier Robusta prefers a higher temperature and can thrive on lower ground. 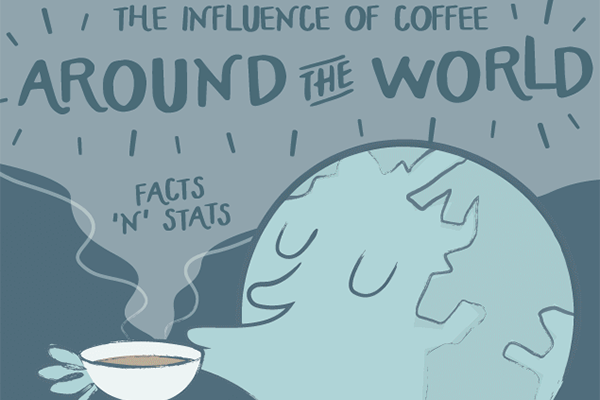 What impacts the quality and flavor of coffee? Everything from the variety of the plant, the chemistry of the soil, the weather, the amount of rainfall and sunshine, and even the precise altitude at which the coffee grows can affect the taste of the final product. These key variables, combined with the way the cherries are processed after being picked, contribute to the distinctions between coffees from countries, growing regions and plantations worldwide. The combination of factors is so complex, that even from a single plantation one finds variation in quality and taste. Though coffee farms are found throughout the Hawaiian islands, it is Kona coffee, from the large island of Hawaii, that is best known and always in high demand. Here, nature provides just the right environment for the coffee trees on the slopes of the active Mauna Loa volcano. Young trees are planted in black, volcanic soil so new that it often seems the farmers are growing seedlings in rock. Afternoon shade from tropical clouds forms a natural canopy over the trees to protect them from intense sun, and frequent island showers give the plants just right amount of rain. Kona coffee is carefully processed to create a deliciously rich, aromatic cup of medium body. Small Mexican coffee farms are more common than large plantations, but with over 100,000 coffee farmers, Mexico ranks as one of the largest coffee producing countries in the world. Most farms are in the southern states of Veracruz, Oaxaca and Chiapas. A cup of Mexican coffee generally offers a wonderful aroma and depth of flavor, often with a pronounced sharpness. It is an excellent bean for dark roasts and is often used in blends. A Mexican coffee designated Altura means that it was grown at high altitudes. Coffee was brought to Puerto Rico from Martinique in 1736, and by the late 19th century, the island was the sixth leading exporter of coffee in the world. However, major hurricanes and competition from other coffee producing countries forced the island to seek other means for economic survival. Today, the coffee industry is being revived with carefully cultivated coffee from quality Arabica varieties that are produced to the highest standards. There are two major growing regions on the Caribbean island: Grand Lares in the south central region, and Yauco Selecto in the southwest. Both regions are noted for their beans’ balanced body and acidity, as well as a fruity aroma. While perhaps not as well-known as some of its Central and South American neighbors, Guatemala's coffee has a distinctive taste quality favored by many for its rich flavor. There are three main growing regions — Antigua, Coban and Huehuetanango — each with a breathtakingly rugged landscape and rich volcanic soil. Microclimates strongly influence the quality and flavor of the “strictly hard beans” (grown at altitudes 4500 feet/1370 meters or higher). This medium-to-full bodied coffee has a depth and complexity of taste that is almost spicy or chocolatey. Costa Rica produces only wet-processed Arabicas. With its medium body and sharp acidity, it’s often described as having perfect balance. Costa Rican coffee is grown on predominantly small farms, or fincas. After harvest, the cherries are immediately taken to state-of-the-art processing facilities, known as beneficios, where wet method processing begins. The careful attention to quality processing and conscientious growing methods have built Costa Rica’s reputation for fine coffee. Colombia is probably the world's best-known coffee producer and ranks second worldwide in yearly production. A high standard of excellence is maintained with great pride and careful growing on thousands of small family farms across the country. Such care and attention results in consistently good, mild coffees, with a well-balanced acidity. The rugged Colombian landscape provides the perfect natural environment for growing, but the terrain makes it difficult to transport the harvested coffee beans to production and shipment centers. Even today, this is often done by mule or Jeep. Colombian Supremo, the highest grade, has a delicate, aromatic sweetness while Excelso Grade is softer and slightly more acidic. Brazil is the biggest coffee producing country in the world, with seemingly endless expanses available for its production. Coffee plantations in Brazil often cover immense areas of land, needing hundreds of people to manage and operate them to produce huge quantities of coffee. Both Arabica and Robusta are grown, and the climate, soil quality and altitude determine which variety will grow best in which region. A fine cup of Brazilian is clear, sweet, medium-bodied, and low-acid. Coffee legend tells of the discovery of the first coffee trees in Ethiopia -- it’s not hard to believe that coffee originated where wild coffee tree forests are still the primary harvesting source. Generally wet processed, coffee from Ethiopia comes from one of three main growing regions — Sidamo, Harrar, Kaffa — and often bears one of those names. In the cup, an Ethiopian coffee tends to offer a remarkable and bold statement: full flavored, a bit down-to-earth and full bodied. Kenyan coffee is well-known and well-liked, both in the United States and Europe. The beans produce a sharp, fruity acidity, combined with full body and rich fragrance. Coffee is grown on the foothills of Mount Kenya, often by small farmers. Kenyan producers place an emphasis on quality and as a result, processing and drying procedures are carefully controlled and monitored. Kenya has its own unique grading system. Kenyan AA is the largest bean in a 10-size grading system, and AA+ means that it was estate grown. The Ivory Coast is one of the world's largest producers of Robusta coffee, which is strongly aromatic with a light body and acidity. This variety is ideally suited for a darker roast, so they’re often used in espresso blends. In the country where coffee was first commercially cultivated, coffee is still grown in the age-old, century-proven manner. Within the small, terraced gardens of family farms, you can almost always find a few coffee trees. Since water is scarce in this arid land, coffee beans grown here tend to be smaller, and more irregular in size and shape. Lack of water also means that the coffee cherries will be dry processed after harvest. The result is that Yemeni coffee has a distinctive taste that is deep, rich and like no other. In ancient times, when coffee was shipped from the famous Yemeni port of Mocha to destinations all over the world, the word Mocha became synonymous with Arabian coffee. The Dutch combined Arabian coffee with coffee grown on the island of Java to make the first coffee blend -- and one that is still well-known today -- Mocha Java. Indonesia, one of the world's largest countries, is composed of thousands of islands. Several of the larger islands — Sumatra, Java, and Sulawesi — are known throughout the world for fine quality coffee. The coffee plant was introduced to Indonesia by Dutch colonists in the 17th century, and the country soon led the world's production. Today, small coffee farms of 1-2 acres predominate and most of it’s dry processed. Indonesian coffees are noted for a pronounced rich, full body and mild acidity. Indonesia is also known for its fine aged coffees, which were held over a period of time by farmers who wanted to sell them at higher prices. Warehousing gently ages the coffee in Indonesia's warm, damp climate and results in a coffee prized for even deeper body and less acidity. This process cannot be matched — even with today’s technology. Coffee originally came to Vietnam in the mid-nineteenth century when French missionaries brought Arabica trees from the island of Bourbon and planted them around Tonkin. More recently, coffee has been re-introduced and the coffee industry is growing so rapidly that Vietnam is rapidly becoming one of the world's largest producers. Today, small plantations, located in the southern half of the country, produce mostly Robusta coffee. With light acidity and mild body with good balance, Vietnamese coffee is frequently used for blending.